$$ | 11 E. Walton St.
$$ | 505 N. Michigan Ave.
$$ | 15 E. Ohio St.
$$ | 101 Erie St.
$ | 165 E. Ontario St.
$$$ | 660 N. State St.
$$$ | 600 N. State St.
Chicago hotel rates are as temperamental as the city's climate. And just as snow in April and balmy weather in November are not uncommon, it is widely accepted that a hotel's room rates may drop $50 to $100 overnight—and rise again the next day. It all depends on the season and what festivals, conferences, and other events are happening around town. Even so, it's wise to shop around. 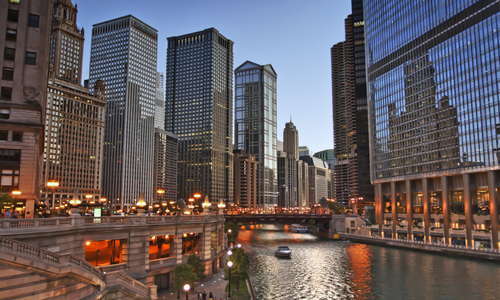 Focus on a neighborhood of interest, like the Near North Side, and you'll find budget chains such as Embassy Suites and luxury properties such as the Four Seasons Hotel Chicago within a few blocks of each other. Ask yourself whether you'd rather be surrounded by the sedately dressed—think Trump International Hotel—or tattooed hipsters, à la the James Chicago. Is it romance you're seeking (try the Drake) or a quick weekend escape with the kids in tow (they can splash around the pool at the Radisson Blu Aqua, then walk a block to Millennium Park)? On the lower end, expect well-maintained, but often boxy and sparsely decorated rooms. The good news is that free Wi-Fi is now a feature of most budget-friendly hotels, such as the Best Western or Holiday Inn chains, and local outfits like the Essex Inn. Top-tier hotels have no problem filling their rooms: in some cases, this has little to do with amenities. Instead, their vibrant bar scenes are the draw, as is the case at the W Chicago–Lakeshore, W Chicago–City Center, the Wit, and the James Hotel. Rooms at these hot spots usually don't go for less than $250, but the "it" factor is huge. That said, between 2013 and 2015 the city saw a building boom that introduced some 2,700 new hotel rooms; the added competition may help lower prices and increase overall quality.